Top two Manchester City and Chelsea both won ahead of their crucial midweek meeting but the latter were close to dropping points at home to Everton. Nikita Parris bagged a brace and set up the other goal, as Manchester City won 3-0 against Sunderland in front on nearly 1,000 at South Shields. Claire Emslie had the ball in the net for Man City on 32 minutes but it was disallowed for a foul on keeper Rachel Laws. However, the visitors were in front soon after as an Abbie McManus cross was headed on by Issy Christiansen and Parris poked home from close range. On 56 minutes Parris turned provider, crossing for Christiansen to head home and the scoring was complete 18 minutes from the end, Parris racing through and drilling in off the post. Emma Hayes’ side just got the goal they needed to keep up with the pace at the top but needed the help of the woodwork to keep out an Everton penalty. Hedvig Lindahl had to turn a Chloe Kelly free kick over the top, as Everton forced four successive corners and the visitors had the ball in the net in the 16th minute but Courtney Sweetman-Kirk was deemed offside. When Sweetman-Kirk went down in the box under an Anita Asante challenge, the Toffees striker hit the resulting penalty against the upright and the hosts broke away with Lizzie Durack turning a Hannah Blundell strike out for a corner. 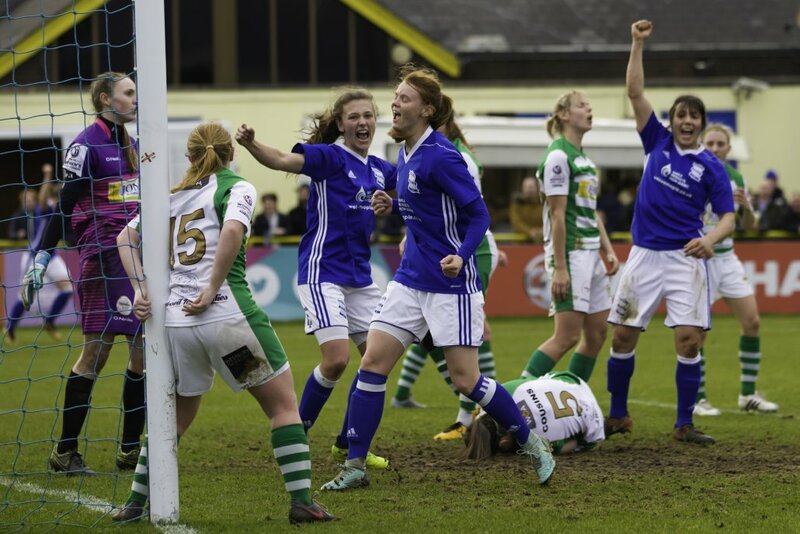 Blundell’s delivery was hit first time by Karen Carney but saved by Durack and in the last minute of the first half both Megan Finnigan and Sweetman-Kirk were very close to near-post finishes for Everton. A great Kelly cross nearly saw Sweetman-Kirk net with an overhead kick and at the other end Durack denied Crystal Dunn and Carney in the space of a couple of minutes. Fran Kirby and Ji So-Yun both worked the visiting keeper after coming off the bench but it was 6 minutes from time that Everton’s defence was broken down, Kirby slipping in Jonna Andersson to fire into the roof of the net. The Blues now have a massive home game against Man City on Thursday evening. Reading and Arsenal cancelled each other out in their second successive game at Adams Park, with new Lionesses manager Phil Neville in attendance. 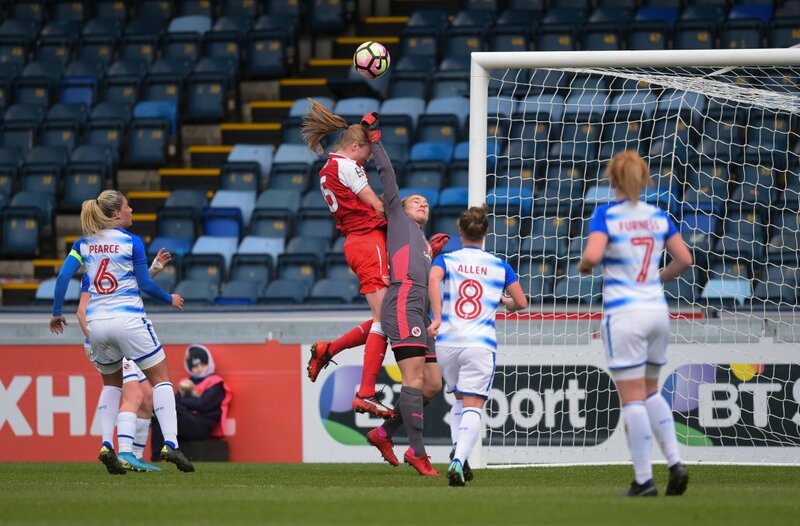 Reading’s Lauren Bruton got on the end of a great Tash Harding cross but could not keep it down and soon after Jordan Nobbs’ free kick was headed on by Louise Quinn but Grace Moloney in the Royals goal was equal to it. Early in the second period, Vivianne Miedema was one-on-one with Moloney but managed to block the srikers shot. Sari van Veenendaal was then called into action to thwart Brooke Chaplen from close range. With 5 minutes left Beth Mead drilled a shot from the edge of the box but Moloney was behind it again. Yeovil Town are still in search of a first goal of the season after conceding three at Birmingham City, who climbed up to fifth in the table. Charlie Wellings volleyed against the Glovers’ post before City were given a penalty for handball, which Aoife Mannion stuck away. Lucy Quinn brought a superb one-handed save from Megan Walsh but the Blues doubled their lead in first half stoppage-time, with a Meaghan Sargeant header at the near post. Moments after the restart it was 3-0, Ellen White netting from close range. White came close to her second but her acrobatic volley was well saved and then Ewers effort from range was turned over by Walsh.